Done and dusted, and half a month late. Ah well, at least I did it. OVAs and what not may follow eventually. I’ll also have a batch of editables soon for translating and such. ~ by Chartfag on May 18, 2010. Is this the complete list of all normal anime aired in summer ’10? It is quiet short. I know that your lists haven’t been complete before either (like, 1-2 crappy anime left out), but this one seems to short. I could use other sites, but your list is much more clearly arranged and it also serves as some kind of eye-candy while choosing the anime I will watch this season. So basically, my question is, will you update your list so that it covers almost all anime (and I don’t mean OVAs or anything, but real series), or should I rather use another source? 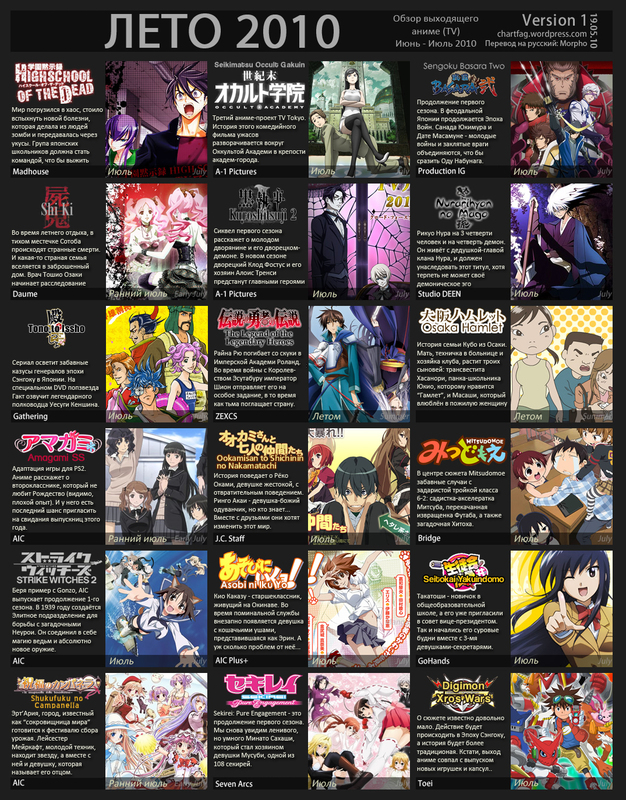 Actually, this is everything that will start airing this summer. You can go and find another source, but you won’t find more anime. Any idea when you’ll release one with each animes air date on it? You’re awesome, Chartfag. I love you man. Strike Witches season 2 and High School of the dead. This Summer Will Be Awesome. Thanks for the chart bro, you’re a huge credit to the anime community. Russian version is just a stupid machine translate. You can remove it from your list. Wybaczcie ,że piszę po polsku . Ale chciałem zrobić wersje polską niestety widzę ,że nie ma ułatwienia i w psd nie ma warstw tekstowych do boksów z danym anime i trzeba ręcznie , szkoda . Mogę liczyć na wersje z możliwością edycji w PS opisów anime ? You’re lucky, the french version could still be found in the log of my browser. thanks for this chart, we really appreciate your work. btw, its been a whole year since I started translating you charts. I used it for my blog. For the record, I really like when you include descriptors like “Sequel,” “Manga Adaptation,” etc. Please squeeze that into the Fall chart if you can. I may include it, but no promises. Since I’m a true follower of your work and you stated that you actually are interested for your chart to be in different languages, I thought I should just give it a shot and grace the german anime community with my version. Long story short, here you go. I love how the charts keep getting more fancy-looking every season, now even smoother with the logos added etc. The two best ones are missing, is it because they are OVAs? I haven’t done OVAs yet, that’s all. Muchas gracias por la nueva versión, y tambien gracias por la versión editable para traducir…ya estoy sacandola al español para cualquiera que quiera verla en ése idioma, la terminaré pronto. En cuanto la termine la dejo aquí primero. Bakatest 2 is only coming in 2011. Aqui dejo la versión en español, de nuevo gracias por el gráfico. Here I leave the Spanish version, again thanks for the chart. Great work! The “July” is a bit hard to read though. I’ve been looking forward to this for a while. Thank you very much for the new version, and also thanks for the editable version to translate … I’m pulling it into Spanish for anyone who wants to see her in that language, will end soon. As I leave here the end of the first. where is Black Lagoon: Roberta`s Blood Trail? Thanks for all your work, good sir! Not much grabbin’ me except Ookami this season. yay! been waiting for a while now…and I thought that you gave up o ever releasing a chart for the coming summer season…oh well, everything is all worth the wait. THANKS. So, where do you want your shrine of worship to be built again? Hey Chartfag. Contact me. I have something to talk about. Awesome work. Can you also start releasing these in hq/lossless .png format? The Strike Witches anime is set in 1944, not in 1939. Could be 1945 as well, since some time passed after S1. pro work with the chart, the new style rocks. Thank you so much for your work. For some reason I come here every Pre-season to get your chart and plan my anime viewing for the upcoming season. Only ones I’m looking forward to at this point is the HotD anime and Sengoku Basara. Thanks as always for you disposition to do this to us!